Something to look forward to: New PCIe SSDs have been added to Gigabyte's lineup that will be available very soon. Although not in contention for record-breaking speed, the drives may be affordable and offer good value. Gigabyte Technology Co. is generally known for its line of motherboards and graphics cards, but also happens to offer solid state drives. 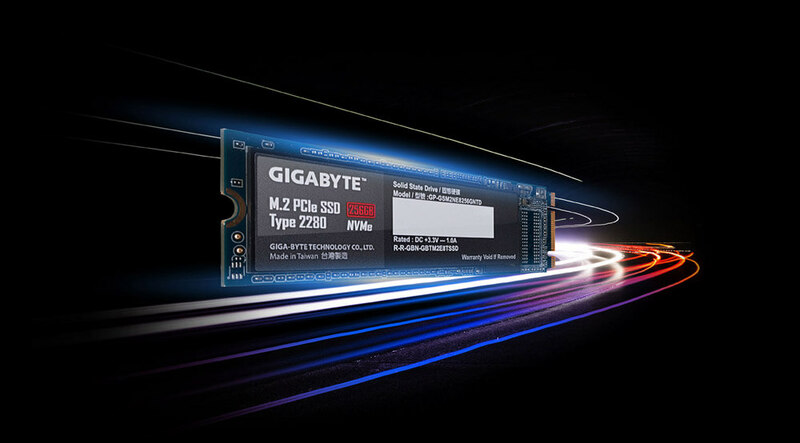 Moving beyond its UD Pro series of 2.5" SATA SSDs that launched in May, Gigabyte is introducing three M.2 PCIe SSDs. All new drives fit into the standard M.2 2280 form factor and operate over PCIe 3.0 x2, NVMe 1.3. Starting at the lowest capacity, the 128GB NVMe drive is rated for sequential reads up to 1100 MB/s and writes up to 500 MB/s. The 256GB model is slightly faster at 1200 MB/s read and 800 MB/s write. A third 512GB model will be available shortly but no specs have been shared on the largest variant yet. In terms of endurance, the 128GB model is rated at 100TB worth of writes. Doubling the capacity to 256GB doubles the endurance to 200TBW. Mean time between failure ratings are set at 1.5 million hours for both capacities and each carries a three year limited warranty. Gigabyte has shipped the 128GB and 256GB drives to retail partners and expects to have them available to consumers very soon. The larger 512GB SSD is intended for shipment in the near future. Pricing is not yet available. Clearly Gigabyte is not intending to compete on raw performance with rivals. Performance figures do not place these drives in a competitive place on read/write speeds alone. Should these new SSDs arrive at a value price point, there could be reason to give them a try. Still looking for more storage? Take a look at our Best of Storage guide.